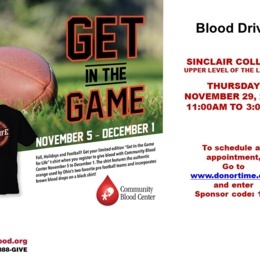 The Sinclair Honor Society, Phi Theta Kappa, Nu Pi Chapter is sponsoring their second blood drive of the Fall Semester. There is always a need for blood and only volunteer donors can fulfill that need for patients in our community. Nationwide, someone needs a unit of blood every 2 to 3 seconds and most of us will need blood in our lifetime. Please consider donating!